Trend Deep Security – Customizing the alert configuration. 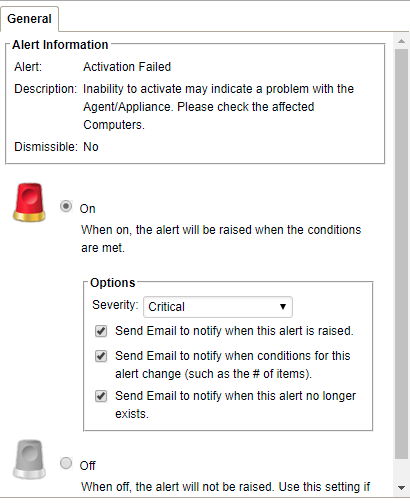 In Trend DSM, if we want to send the alert email notification , we have to go to settings – alert and select what type of notification we want to receive but by default all the alerts are enabled and to disable we need to open each alert and select it manually. It will take time to open and modify each alert and easy way to fix the same is to open the SQL database and run the below query . The 3 columns “NotifyStart”, “NotifyEnd”, and “NotifyChange” if the value is set to 1, it means it will generate an email alert for that alert type. We can use the following sql queries to turn off all these settings. Once the alert configurations are turned off, you will need to enable the alert you want to receive notification manually from the Deep Security Web Console, this action helps you turn off all of the settings instead of having to go through them one at a time. This entry was posted in Trend Micro Deep Security, Trend Micro Deep Security 9.5 Events and Monitoring and tagged Trend, Trend Micro Deep Security, Trend Micro Deep security 9.5 Events and Monitoring. Bookmark the permalink.